The Magnificat is one of the best known Christian prayers. It is based largely on the canticle of Hannah in 1 Samuel 2: 1-10 and some of the psalms. We pray this prayer so often that it is easy to miss its meaning – and how much it tells us about the way God has acted, and continues to act, in human history. It is Mary’s prayer of gratitude and praise to God for choosing her as the mother of the Messiah. The long period of waiting is over and the great hope of Israel is about to be realised. Mary’s own personal experience of God’s action in her own life is the starting point of the prayer: “My soul magnifies the Lord… for he has done great things to me and holy is his name”. Then, the prayer goes on to situate Mary’s experience in the context of the historical experiences of the Israelites from the time of Abraham and Sarah down to the birth of Christ. From its foundation, the people of Israel believed that God was directly involved in shaping their history. He was Lord of the Universe and ruler of all nations but his special love was for Israel. He would be their God and they would be his people. “I have loved you with an everlasting love, therefore I am constant in my affection for you”. Even during difficult times, when many lost hope, there was a small group of Israelites who continues to trust in God’s promise to be always with them and to send them a Messiah. They were called the “anawim” or “the poor ones”. Among them were the parents of Mary. Anna and Simeon, as portrayed by Luke, typify their spirit of openness and trust. “Remember not the former things; nor consider the things of old. Behold I am doing a new thing; now it springs forth, do you not perceive it?” (Is. 43: 18-19). The God Mary praises with all her heart is, certainly, the Loving and compassionate God, “ever mindful of his mercy” – and of course the rich and powerful can receive that mercy if they are open to God’s Word and willing to change their ways. 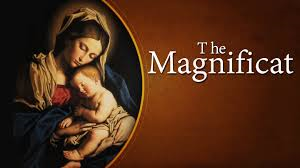 But the God of the Magnificat is clearly a God who is on the side of the poor and downtrodden, those pushed aside and oppressed by the rich and the powerful. This is the God, whose Son Mary “bore in her womb with love beyond all telling” (as the Second Advent Preface so telling puts it). This is the God that Jesus Christ came to reveal. 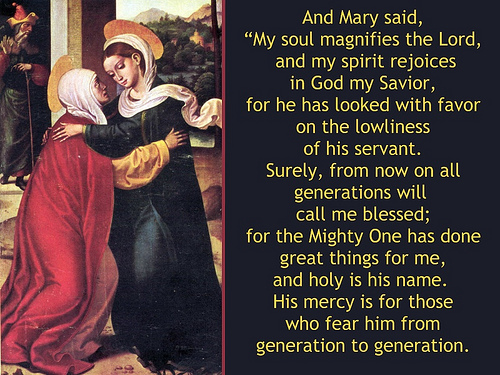 A very fruitful way of praying the Magnificat is to pray it along with Mary, identifying with her feelings. From the moment the Angel left her, Mary knew that Jesus was present within her. But she had nine months to wait – to wait for her child to appear, to show himself, so that she could see him, touch him, feed him, hug him, and kiss him. Women, especially mothers, can easily identify with Mary’s feelings during her pregnancy, the joy and the pain, the longing and the anxiety – until her time was ripe and the child within her would be there before her. Then she could look into his eyes, hear his cries, and hold his body to her breast. She would experience her child with all her senses: eyes, ears, touch, taste and smell. Then her waiting would be over and her joy would know no bounds. If we let Mary lead us during this novena of prayer and stay close to her, we can be certain that Christ will become more alive for us too and we will experience something of Mary’s joy.